If you're looking to start your own online store, learn how to create barcodes using ASP.NET Core and the third party library, Zxing.Net. I tried to create a QR Code Generator in ASP.NET Core, using third party libraries. But in most cases, barcodes are not fully supported in ASP.NET Core because of some version issues, etc. I searched a lot in Google but finally, I found “Zxing.Net” - a library which supports the decoding and generating of barcodes. I had a discussion with MicJahn and came up with a great solution. A library which supports the decoding and generating of the barcodes (Example: QR Code, PDF 417, EAN, UPC, Aztec, Data Matrix, Codabar) within the images. We need the packages given below for drawing and creating a QR Code Generator. The QRCodeTagHelper class given below contains QR Code Generator methods, etc. The code given below will display a QR Code Generator. The dependencies given below are required to create a QR Code Application. You can download other ASP.NET Core 1.0 source codes from MSDN Code, using the links mentioned below. 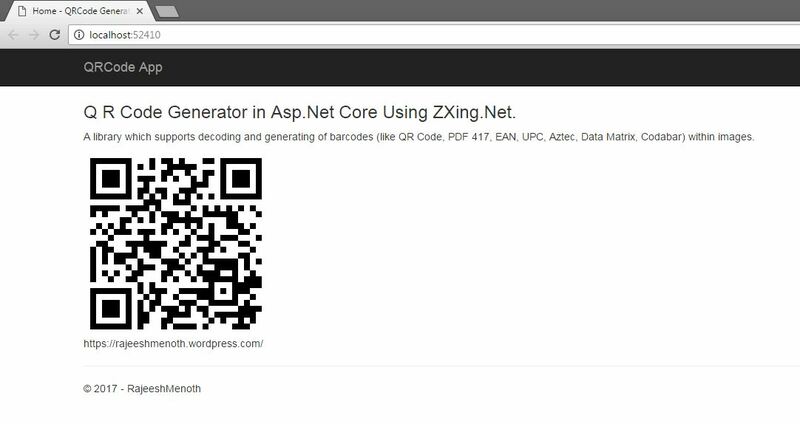 We learned how to create a QR Code Generator in ASP.NET Core 1.0 using Zxing.Net. I hope you liked this article. Please share your valuable suggestions and feedback.